Azerbaijani Manat (Azərbaycan manatı, Азербайджанский манат). 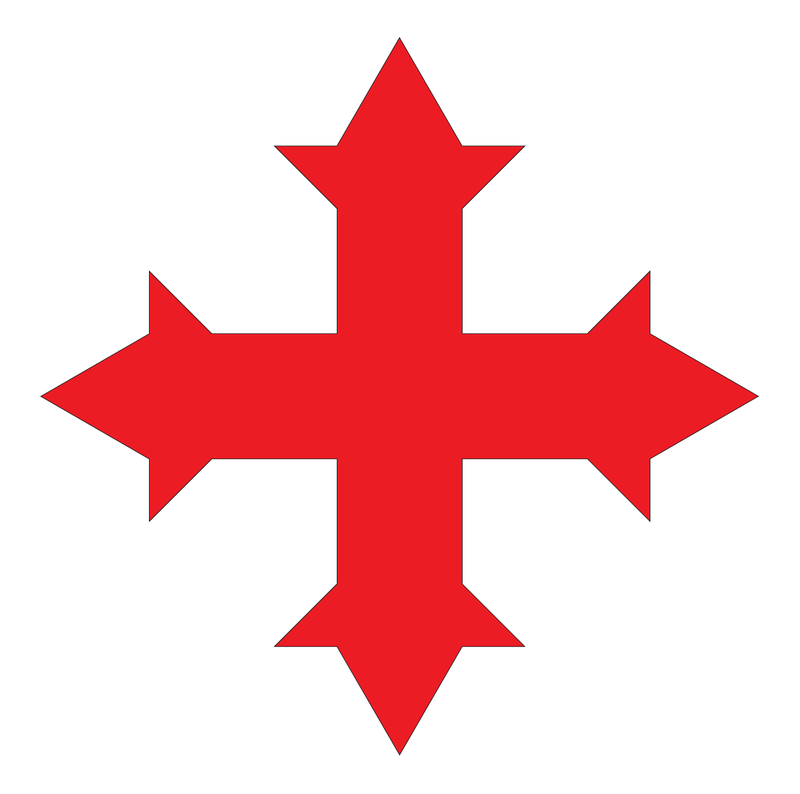 Caspian Cross (Kaspi xaçı, Каспийский крест). Introduction. The original name of Azerbaijan (for both North and South) was Caspiane according to Strabo (book 11, chapter 2, section 15), which is also referred to Caspian Mountains (Caucasian Mountains) and Caspian Sea: "According to Eratosthenes, the Caucasus is called "Caspius" by the natives, the name being derived perhaps from the 'Caspii'". Subsequent invasions, split Caspiane into two distinctive entities Atropatene in south, and later Caucasian Albania in north. Then Caspiane became a little province along the Caspian shores, which later was incorporated into Caucasian Albania, also known as Arran in some sources. The Caspians are also known in history as Kaspi, Kasi, Kassi or Kassites. They first appeared in the annals of history in the 18th century BC when they attacked Babylonia. Kassites (Caspians) founded the Dynasty of the Sealand of the ancient Sumer, the longest ruling dynasty in the history of Mesopotamia (1531-1155BC). 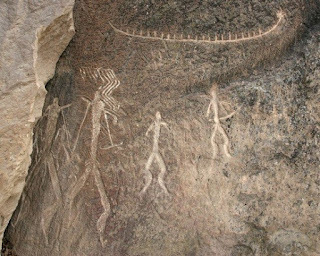 The Caspians were excellent sea explorers and from Gobustan petroglyphs we can see the shape of their boats. Aramaic papyri from Egypt, and Herodotus (3.93.2) mentioned the Caspians as far as Egypt in the west, and Pamir Mountains in the east. 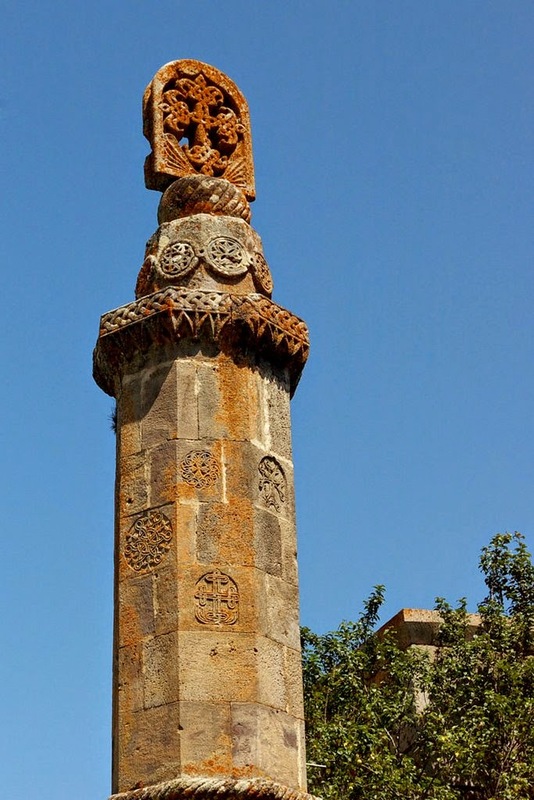 The ancient Caspian Cross ("Kaspi xaçı" in Azerbaijani) was officially introduced in 313AD as a symbol of the kingdom and the church. King Arran was a founder of the Kingdom of Caucasian Albania according to Latin sources. The cross itself represent the greek, sometimes latin, cross with the oriental flour-de-lis at its ends, which represents a fire or a flame, it is a common symbol for Azerbaijan and the present city symbol of Baku. 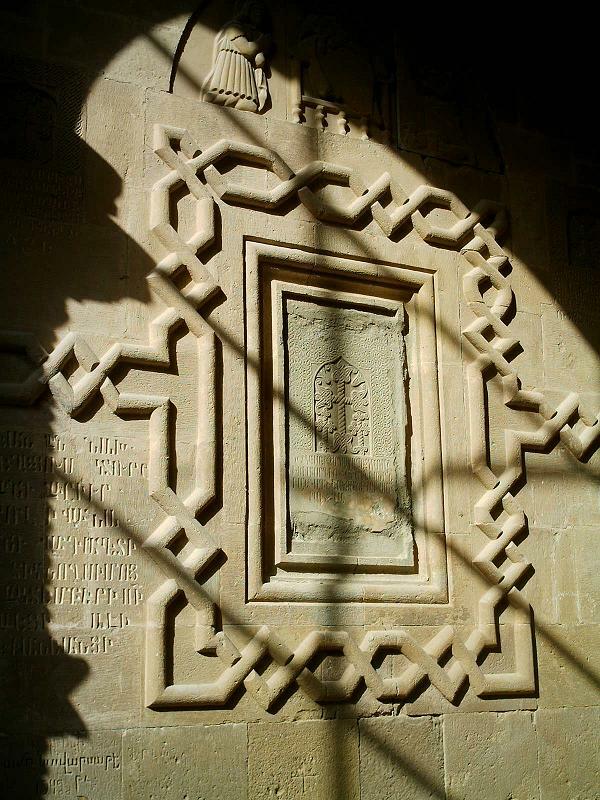 The cross above is the Caspian Cross as it is seen in the Round Temple, Shaki (Azerbaijan). There are also in Kish, Nij and other places across Azerbaijan, Tatev Monastery in Syunik, Armenia. 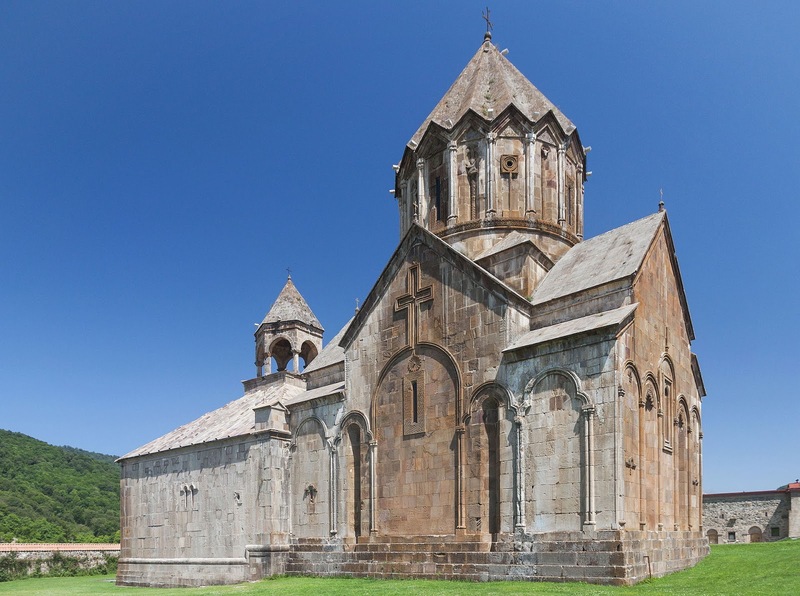 All these churches are the part of the Church of Caucasian Albania (Azerbaijan) which used to head quartered in Gandzasar Monastery (presently territory occupied by Armenia), or Gəncəsər Kafedralı (Cathedral) as it is known in Azerbaijani. 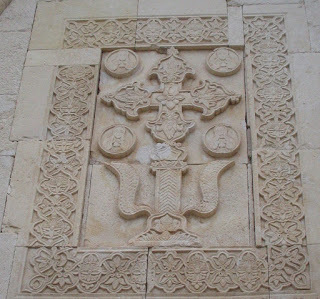 Caspian Cross can also be observed on the walls of Kara Kilise, or Qara Kilsə in Azerbaijani, of West Azerbaijan province of Iran. 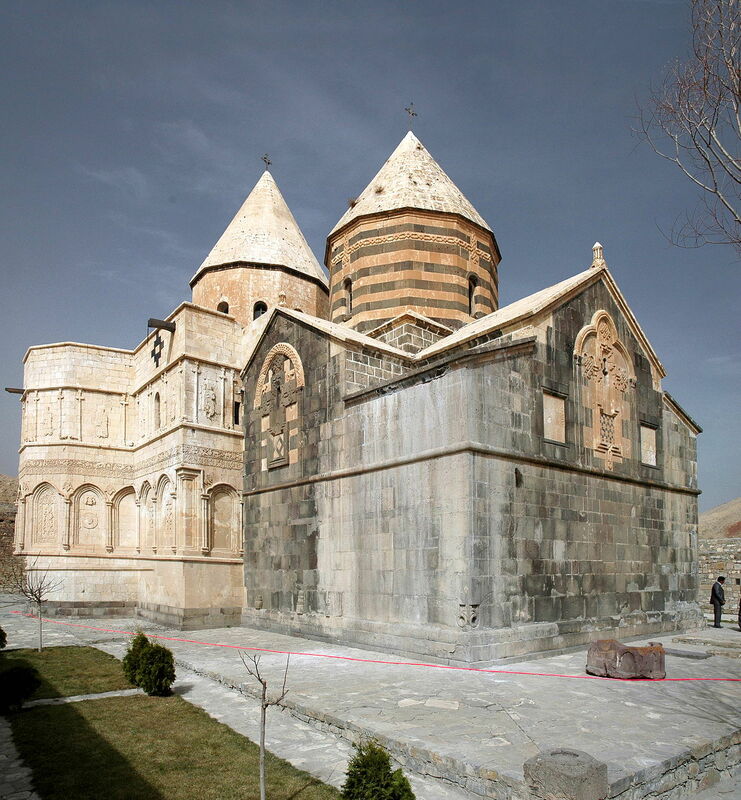 Kara Kilise is also known as The Monastery of Saint Thaddeus. 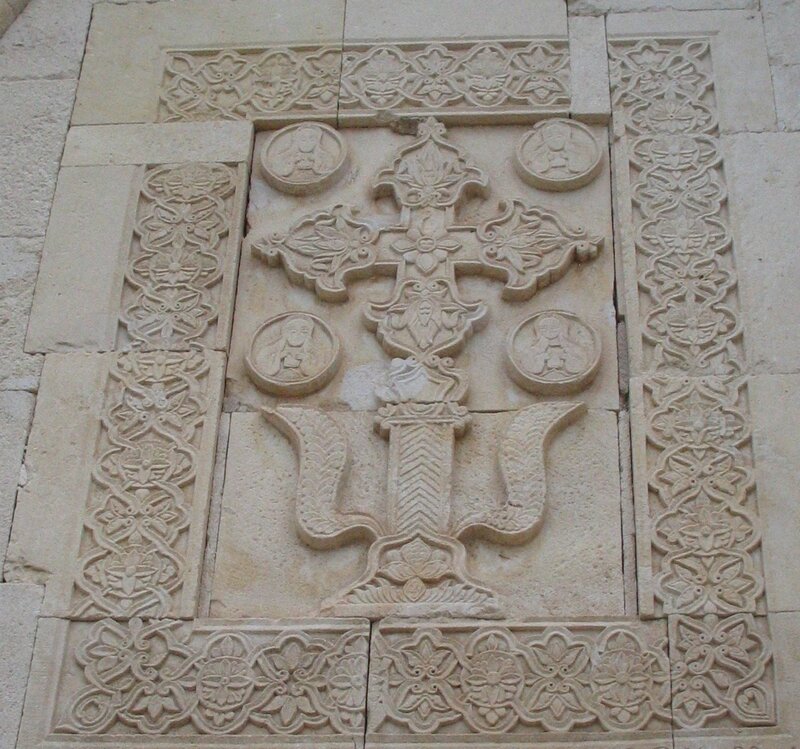 In some places across South Caucasus, the Ancient Caspian Cross as well as churches and monasteries were vandalized by the Armenian inscriptions as a result of the forceful amalgamation of the Church of Caucasian Albania into the Armenian Church. 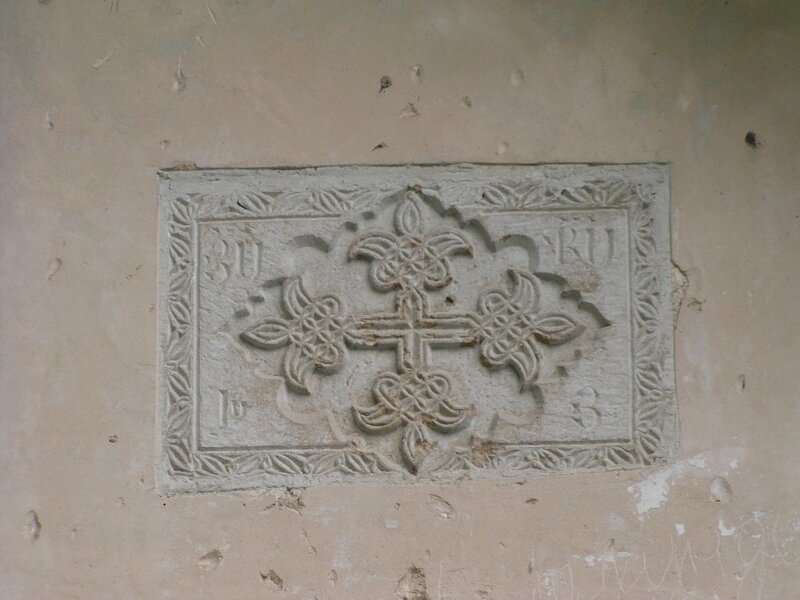 Here is another example of Caspian Cross being vandalized by by the Armenian inscriptions, but this time in the side wall of Saint Stepanos Monastery, East Azerbaijan province of Iran. 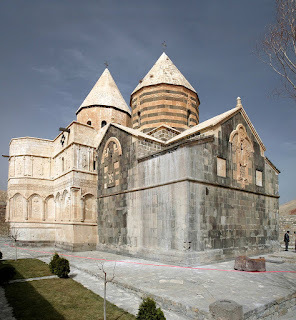 On the picture below, you can see Caspian Cross of the top of Saint Stepanos Monastery, East Azerbaijan province of Iran, with the outside walls being vandalized by the Armenian inscriptions. 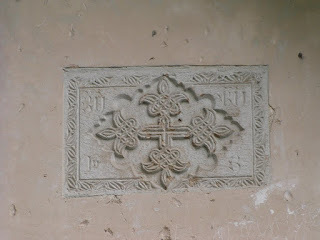 The oriental flour-de-lis from the Caspian Cross can also be seen on the Azerbaijani muslim grave stones in Yeddi Gumbez Mausoleum, Shemakhi (Azerbaijan). This proves the cultural continuity among Azerbaijanis regardless their present religious believes. Church. 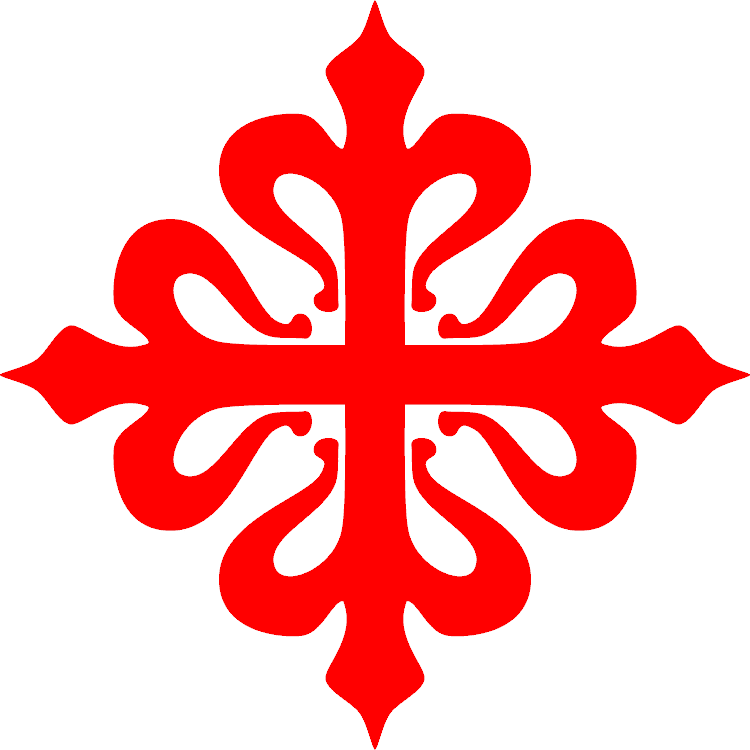 Church of Caucasian Albania is is an Autocephalous Orthodox Church and was first established by the Holy Apostle Bartholomew in Baku; and then by St. Elisha in the village of Kish, north of Azerbaijan. Upon the end of Russian-Iran War (1826-1828), Tsar Nicolas I of Russia signed "The Decree on managing the affairs of the Armenian-Gregorian Church in Russia" ("Положение о управлении делами Армяно-Григорианской церкви в России") in 1836, which set the start for the amalgamation of the Church of Caucasian Albania and its properties into the newly formed Armenian Church (the institution as we know now) and subsequently turning the Armenian-Grigorian Church itself into the Orthodox Church with the head quarter in Etchmiadzin, also known as Üçkilsə or Üçmüəzzin in Azerbaijani. 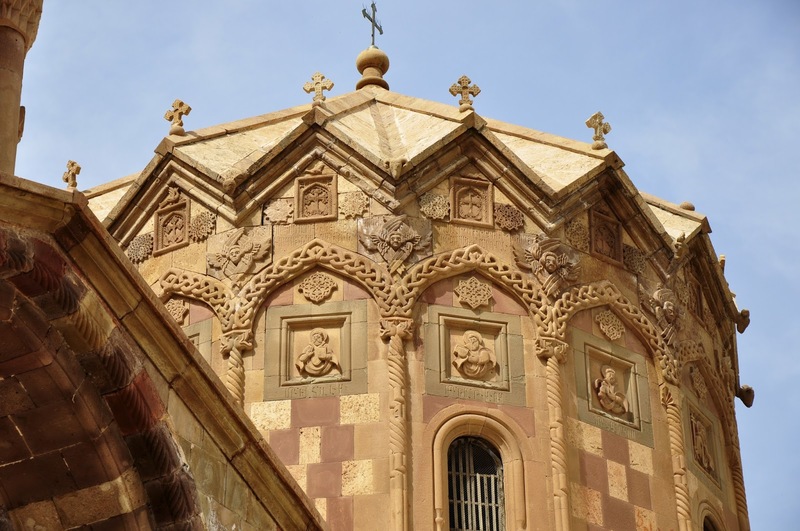 Armenians first appeared in North Mesopotamia after the expansion of the Achaemenid Empire. They were originally one of the Persian tribes which were placed to weaken the Assyrian power and influence in the region. During the Roman and Parthian empires, two agreed to create a buffer state, Kingdom of Armenia, on the mutual border in Northern Mesopotamia to prevent further confrontations between each other. The Parthian noble family of Artaxiad were instated as the puppet ruler of the new kingdom, meanwhile the kingdom itself became a vassal state of Rome. The territorial expansion of Kingdom of Armenia, claimed by the Armenian historians, actually were made by the Roman legionaries on behalf of Rome and for the Roman glory. 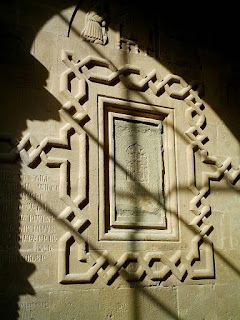 The Roman stone inscription "Legio XII Fulminata", carved between 84 and 96 A.D in Gobustan (Azerbaijan) is clear evidence to that. The Church of Caucasian Albania was re-established in Azerbaijan in 2003 as the Church of Caucasian Albania-Udi. 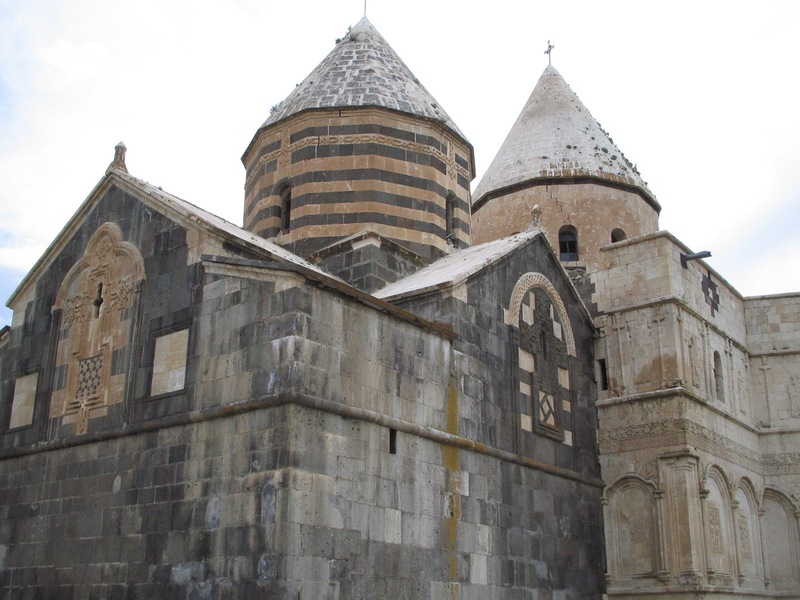 In 2013 during 1700th anniversary of establishing Christianity in Azerbaijan, the grand opening of the Church of Arran took place in the village of Nij. Below, I propose the flag of the Church of Caucasian Albania-Udi, all Azerbaijani christians, and the flag of Nagorno-Karabakh region of Azerbaijan, as a Christian enclave within Republic of Azerbaijan as oppose to the current flag of Nagorno-Karabakh, which represent an Armenian aggression and appropriation of our churches by foreign hordes. 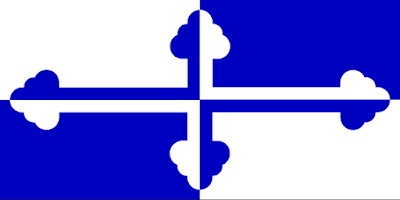 As oppose to the current flag of the Nagorno-Karabakh enclave, which is a duplicate of the Armenian flag, this flag represents the past and present of the Azerbaijan Christian heritage. White represents the silver caps of the Caucasian mountains, which is used to be known as the Caspian mountains, and Blue resents the Caspian sea. Four parts are the regions of Azerbaijan: three parts represents regions formed as a result Kura and Aras rivers flowing through the historical Azerbaijan; the fourth part is Mughan and the chain of islands in the Caspian sea. Etymology of name Caspian. 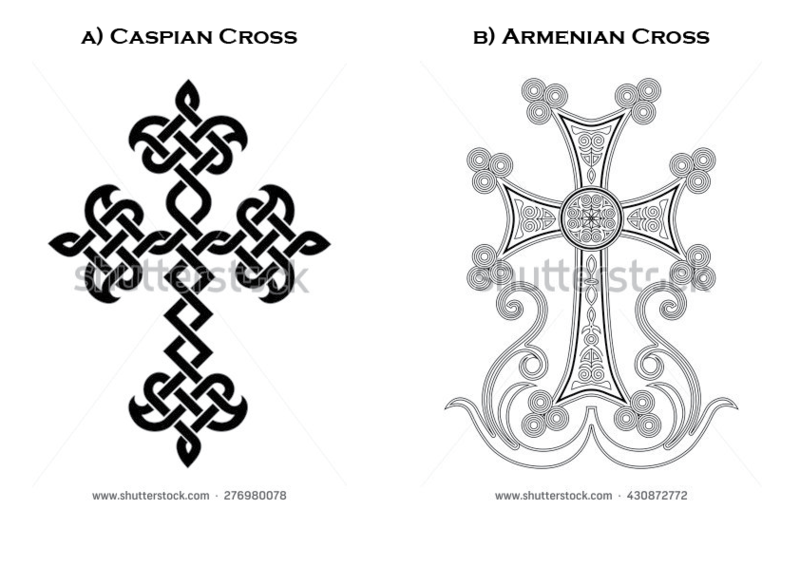 Most likely the name refers to color "white" in various contexts such as cloud and silver-like. We know for sure that the Hebrew name Caspi or Kaspi means "made of silver" or "of silver", and it has roots in Aramaic who loaned it from the ancient people of Mesopotamia, the Sumerians, who called Silver - KASP(I)UM. 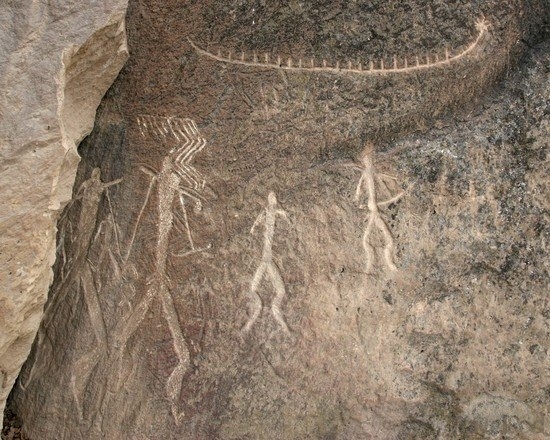 It is possible that there is a link with the fact the Caspians were skillful metallurgist, and we can draw parallel with the giant Prometheus, the first ever “metallurgist”, who was chained to the rocks of the Caucasus by the gods. Pliny the Elder's Natural History (77–79 AD) derives the name of the Caucasus, which used to be called Caspian mountains, from Scythian kroy-khasis ("ice-shining, white with snow"). Besides, in antiquity Republic of Azerbaijan (Caspiane) was also known as Caucasian Albania, which probably was a direct translation from the ancient topographic name since the Latin "albus" and Ancient Greek "ἀλφός" (alphos) also means white. Ancient people of Asia Minor, Hittites, defined the cloud as "𒀠𒉺𒀸", which reads as alpas, similar to the Ancient Greek. Alphabet. There were 26 ethnicities in Caucasian Albania according to Moses of Kalankatuyk. All of them could be separated into three major linguistic groups: Turkic, Caucasian, Iranian languages. The alphabet of Caucasian Alphabet was known to have 54 letters. There is an evidence that the Greek alphabet was used among Turkic Christians. 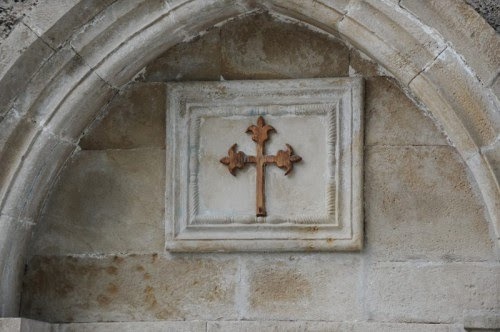 Those ones due to an oppression from the Armenians (non-orthodox christians), Arabs and Mongols, those Turkic speaking christians migrated from Azerbaijan to Cappadocia and formed the Karamanli community, the Karamanlides. The Greek alphabet for writing Turkic is called Karamanlidika (Καραμανλήδικα / Καραμανλήδεια γραφή). Example, Bardanes Tourkos (Βαρδάνης ὁ Τοῦρκος) was a Byzantine general of the Turkic origin who launched an unsuccessful rebellion against Emperor Nikephoros I (r. 802–811) in 803. His name shows that he was baptized, and of the Turkic origin. 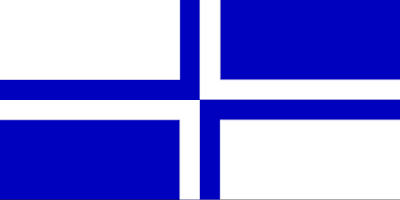 Another example, Tauri and Bulgars, Gagauzians and Urumians are also another example of the Orthodox Christians of the Turkic origin from the Black Sea basin who used the Greek alphabet. Azerbaijani language, although, is a member of Turkic branch of Altaic group of languages, unlike languages of Indo-European or Semitic groups of Middle East and Caucasus, it is well structured and has all features of Sumerian language such as agglutination and vowel harmony. Just like Sumerian, the Semitic alphabets are not suitable for Azerbaijani language. The Latin script is most practical of all alphabets, and it is an official alphabet of the Republic of Azerbaijan. "Our Father" Prayer in Codex Cumanicus: Atamız kim köktesiñ. Alğışlı bolsun seniñ atıñ, kelsin seniñ xanlığıñ, bolsun seniñ tilemekiñ – neçikkim kökte, alay [da] yerde. Kündeki ötmegimizni bizge bugün bergil. Dağı yazuqlarımıznı bizge boşatqıl – neçik biz boşatırbiz bizge yaman etkenlerge. Dağı yekniñ sınamaqına bizni quurmağıl. Basa barça yamandan bizni qutxarğıl. Art. The Caspian Cross was adopted by the Order of Calatrava (a Spanish military order from Castile) in 1164, and Patek Philippe and Co. (Swiss luxury watch manufacturer) was using it as a company logo since 1851. 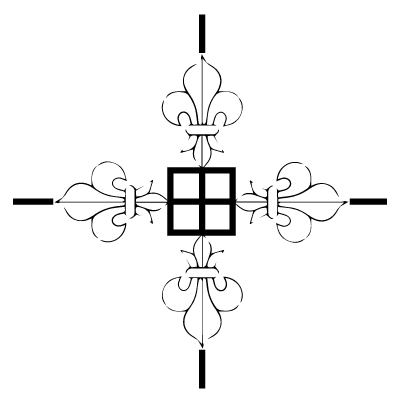 More derivative variations of the Caspian Cross as an art abstract used in the textile, furniture and decoration in general. Some organizations or individuals try to present Caspian Cross as Armenian Cross, although two are completely different. 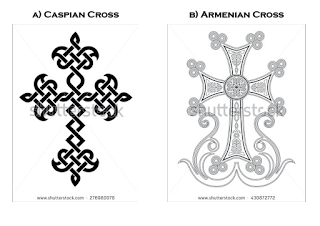 Shutterstock.com wrongly have a) Caspian Cross (left) being distributed as b) Armenian Cross (right). Manat is a name for the national currencies of Azerbaijan (since 1918), Turkmenistan (since 1993), Georgia (1918–1923), North Caucasian Emirate (modern Dagestan-Chechnia-Ingushetia, 1919–1920), and Provisional National Government of the Southwestern Caucasus (1918–1919). Manat was also the designation name for the Soviet ruble in Azerbaijani, Turkmen and Georgian languages. Azerbaijani manat is subdivided into 100 qapik. 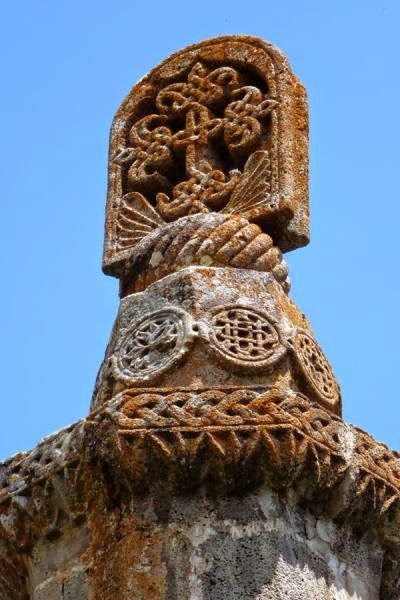 Ancient Caspian Cross of AzerbaijanIntroduction. The original name of Azerbaijan (for both North and South) was Caspiane according to Strabo (book 11, chapter 2, section 15), which is also referred to Caspian Mountains (Caucasian Mountains) and Caspian Sea: "According to Eratosthenes, the Caucasus is called "Caspius" by the natives, the name being derived perhaps from the 'Caspii'". Subsequent invasions, split Caspiane into two distinctive entities Atropatene in south, and later Caucasian Albania in north. Then Caspiane became a little province along the Caspian shores, which later was incorporated into Caucasian Albania, also known as Arran in some sources.